Baby David learns how to Potty with Elmo! I knew potty training was going to be a challenge but next time, someone please remind me to stand my ground and wait until the kids are ready. Ever since Carlo started taking Valentina to the playground (the one we go to now) he’s been talking about getting Valentina potty trained. All of her friends are off the diaper and she’s not. There are 2 kids in nursery (at church) who are off the diaper… she is not. I knew she wasn’t ready but Carlo insisted. He brings up the fact that Luca (who is one month younger) is potty trained. Not to mention Camilla who asked her mom to take the diaper off at 18 months because it bothered her. I then start with the.. “Well, most kids don’t start until they’re 2.5 or closer to 3” and then start naming kids. It’s been a very long 2.5 months and we haven’t progressed that well. Like all parents, we began by showing her the potty and taking her with us in the bathroom. She would sit on hers and we go through the motions. Finally we decided to try. 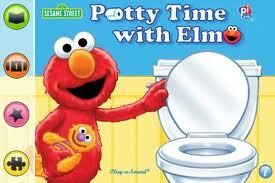 Since she loves to play with the iPod, I bought the ‘Potty time with Elmo’ app. It was working quite well and she enjoyed listening to the story and playing with the games. We were on our way to success! We encouraged her when she went pee and gave her some candy called ‘Smarties’. They’re like M&M’s. 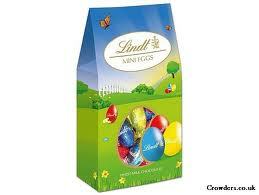 I buy them in a fun size package so it makes it really easy to reward her with a few or even a whole box. If she goes penguin, aka poop, then she gets a bigger piece of chocolate like a chocolate egg. (leftover Easter candy!) She was doing so well! Like all kids, she had to get used to it and she would say, “Uh Oh” when she had an accident. Then she would acknowledge that she peed. Then she would tell me she had to go and we’d run to the potty. There were a few days with one or even zero accidents. We were so proud of her… until one day, she regressed. She just STOPPED! She started telling us afterwards, then jumping in her puddle of pee (thank you Peppa Pig- who likes to jump in muddy puddles), then not at all. It got to the point where I had to fight her to get on the potty. After 2.5 months I was done. I wanted a break. She needed a break. It wasn’t fun anymore for her.. or for me. It was also getting harder for me since my belly was/is getting bigger. The only time she would ask to go was during nap time/bed time. She knows I would drop everything to get her to the potty and she would delay going to sleep. One day, she had peed on the floor, the couch and her bed… in the space of 2 hours! I had just put a mattress protector on her bed and 5 minutes later she peed. She even came to tell me she peed on her bed. I had had enough. I put a pull up on her and I was done. I called Carlo at work as usual and told him what happened. He came home all positive and optimistic and said, “We’ll try again tomorrow.” I put my foot down and said… “Uh.. NO we’re not! I need a break and so does she. It’s not fun anymore.” After what seemed like forever, I got my way and the pull ups came back. I knew we had to just stop and not mention the potty for a while. I also had the support of the parents at the playground which made it better. Not to mention that my mom and Aunt were coming to visit for 2 weeks and we had planned a few trips while there were here. I wasn’t going to deal with the hassle of potty training on a train! During this last week, Valentina has started becoming interested again in going potty. My mom and Aunt left last week and we put her back in underwear the very same day. Of course it took a while to get used to things again and we had lots of accidents. The weather has been crummy and we don’t have a dryer so, she was running out of clothes and they weren’t drying fast enough so she had to go back to pull ups on half days. Just a few minutes ago, she ran past me with some toys and said, “Mommy, potty potty! !” and went straight to the bathroom. 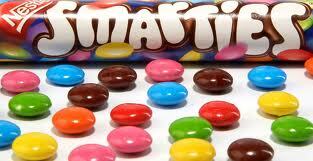 She did go potty and got her small box of Smarties! Looks like we’re on the right track!! I think her new favorite song is really helping her! She will ask to watch this at least 10 times in an hour! What a potty journey! You're so right, they have to be ready. MIne all trained at very different ages, anywhere from 2.5 to 4. The pressure to be at certain stages with things comparing your kid to other kids is bad. Each kid is so different! I'm mostly dying that there is an app for potty training! Now that is definitely a new era!